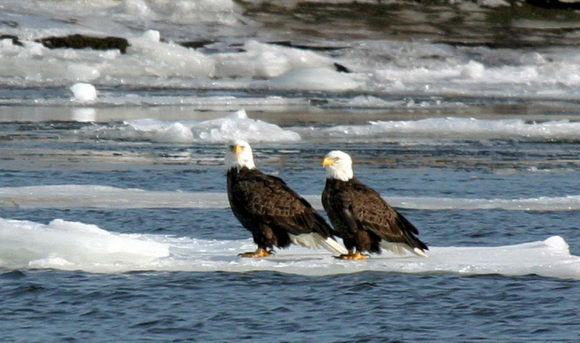 Eagles on Ice: White-headed adult eagles can be seen in numbers along the lower Connecticut River. Photo by Mark Yuknat. Winter along the Connecticut River brings many things – including cold winds and grey skies. But the change in seasons also signals a shift in the ecology of New England’s Great River. The osprey, the swallows and the egrets may be gone, but in their place now are mergansers, goldeneyes, and the highlight – bald eagles. These once rare, majestic birds can be seen fishing along the unfrozen lower Connecticut River, a testament to one of the greatest environmental recoveries of the last half century. To highlight these winter wonders, Connecticut River Museum (CRM) has planned a range of programs and activities. 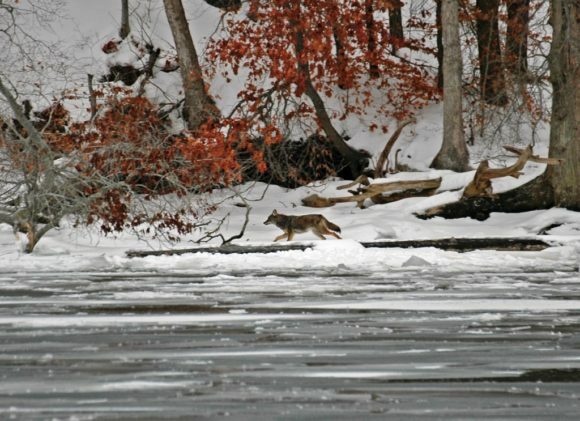 Connecticut River Museum is happy to again partner with Connecticut River Expeditions to offer Winter Wildlife Eagle Cruises in February and March. These popular trips offer visitors a chance to get out on the River in winter to see eagles, as well as other winter species that visit the estuary such as harbor seals. 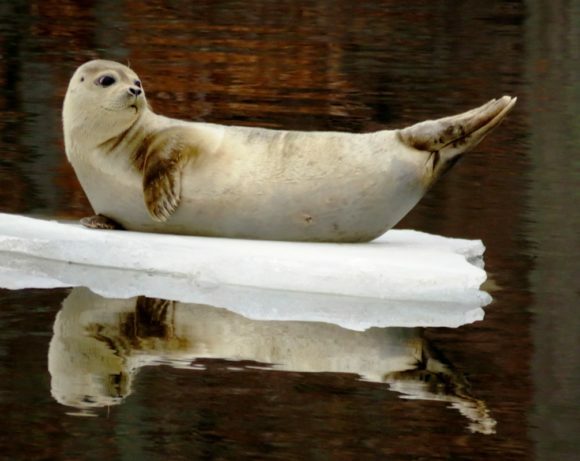 This seal is relaxing on the Connecticut River ice. Photo by Bill Yule. Cruises aboard the environmentally friendly R/V RiverQuest provide passengers with a comfortable, heated cabin supplied with hot coffee and tea, as well as binoculars to aid in spotting and narration from a staff naturalist. These cruises depart Fridays, Saturdays and Sundays at various times in the morning and early afternoon, and are $42 per passenger. Museum members get 10 percent off and group rates are available. In addition, the Museum will offer its annual Eagles of Essex exhibit, which offers a wealth of information about bald eagles and their return to the lower Connecticut River. Patrons can try their hand at building an eagle nest, and marvel at life size silhouettes of Eagles and other large raptors, a map showing good shore viewing locations, and other displays. On the opening day of the season, Saturday, Feb. 3, the exhibit will host Family Activities related to the return of the Eagles from 1 to 4 p.m., free with Museum admission. On Saturday, Feb. 17 and March 17, award-winning photographer Stanley Kolber returns to CRM to offer his annual Bird Photography Workshop. Kolber has been photographing birds for years, and takes great pleasure in sharing his experience with aspiring photographers of all levels, through anecdotes, slides, and question and answer. In addition to helping skills development, his greatest pleasure in giving workshops is the opportunity to kindle and encourage his audience’s interest in the natural world. He hopes that young people as well as adults will attend the workshops, so that he can impart some of his own enthusiasm to the next generation. These popular programs are also free with Museum admission. Species other than Eagles visit our River during the winter months. Photo by Joan Meek. A Live Birds of Prey Show will be offered on Sunday, Feb. 18 at 4:30 p.m. CRM will partner with Horizon Wings Raptor Rehabilitation Organization for this annual show, which features a bald eagle and several other species of raptors. Visitors will be able to get an up close look at the birds while learning more about the lifecycle and ecology of these magnificent animals. This event will be held at the Centerbrook Meeting House and is free to the public. For a full listing of event details, visit www.ctrivermuseum.org or call 860-767-8269. The Connecticut River Museum is located on the Essex waterfront at 67 Main Street and is open Tuesday – Sundays from 10 a.m. to 5 p.m. The Connecticut River Museum, located in the historic Steamboat Dock building, offers exhibits and programs about the history and environment of the Connecticut River. For more information, call CRM at 860.767.8269 or RiverQuest at 860.662.0577.